Our story began in 1932 with a clear goal: to improve the quality of life and work of farmers. This is how our first self-seeding machine was born in 1951, Carraro's first 'sprout', a machine designed to facilitate and speed up one of agriculture's most important processes. Thanks to our experience and skills, we've got the ideal solution for every type of agricultural machine, from tractors to combine harvesters. Driven by the desire to innovate, the company began producing tractors in the 1950s and in 1958 our first Tre Cavallini tractor was born. It was during this same period that the company was transformed, thanks to the entrepreneurial spirit of Mario Carraro, who at a very young age took over the helm after graduating from high school. 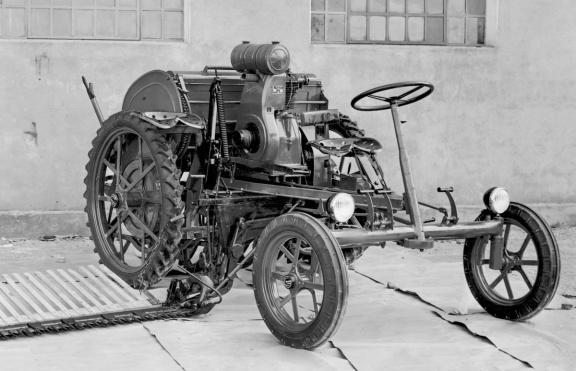 Carraro tractors followed such a rapid evolution that in 1964 they were the first ever to have four-wheel drive. Thanks to the distribution of the engine power over all four wheels, the vehicle became even more stable and had more grip, even on rough terrain and steep slopes. Over the years we increased our ability to listen to the needs of the market and to be ready for change. It is precisely for this reason that, at the dawn of a profound restructuring in the world of agricultural mechanisation, we decided to diversify our strategy. In 1973 we decided to focus the core of our production on the heart of the vehicles themselves. Thus the Carraro axles and transmissions division was established. The new strategy enabled us to quickly become a partner of reference for the world's leading manufacturers of agricultural machinery and earth moving equipment. In the following years the success of the axles and transmissions division grew until, in 1985, we were recognised as world leaders in the sector, with over 100,000 axles sold. In the 1980s we introduced the Kaizen method, optimising resources and eliminating inefficiencies. As a result, production reached such a high growth rate that we decided to inaugurate new specialised affiliated divisions. The plants in the provinces of Padua and Rovigo and Maniago merged into a single beating heart and the Carraro Group was born. With the aim of expanding the Group, on 27 December 1995 the holding company Carraro SpA was listed on the Milan Stock Exchange. This was a new turning point, starting us down a path of growth and production expansion well beyond our national borders. In 1997, we launched the internationalisation phase with the first industrial plant in India. In a short time we expanded production, reaching North and South America as well (2000). The international expansion phase reached its peak between 2006 and 2007, with the establishment of the Carraro Technologies India R&D Centre and inauguration of the new Qingdao plant in China. In 2008, global industry suffered a heavy blow, in every part of the world and in each sector, but we were able to ride out the storm and grow as well.. Research for new solutions continued and in 2010 we launched Agricube, the innovative range of specialised tractors for vineyards and orchards. This represented a significant change for those working in the farming world. The design of the machine was also transformed, taking on new shapes and colours, from the historic red to a more modern grey. In a global context still evolving, in November 2011 we decided to involve all our employees, over 4,000 people, in the Carraro Values programme. It is essential to have well-incorporated and well-shared common principles. This means moving beyond the oral tradition, where the corporate culture was handed down by osmosis. We were able to reach a new awareness, one that can be shared at all levels and at all latitudes. It is a path that continues in everyday life, in the conduct of our people. Aware that "We are Carraro”. The base of common values is also founded on a common history with its roots in that company to the north of Padua which in the 1930s transformed itself from a craftsman’s workshop into a company. For this reason, the year 2015 saw the inauguration of the Tractor Museum dedicated to Oscar Carraro who, together with his brother Mario, personally contributed to founding and determining the success of the company we know today. In more recent years we have continued to seek maximum efficiency in our products. Today we are developing transmissions and integrated systems that are increasingly oriented towards efficiency and eco-compatibility. In 2017, we launched a new Strategic Plan, a solid basis on which to design our future.